I tend to be leery of Cherry fragrances and don’t purchase them very often. Why? Most cherry scents I’ve tried tend to take on a cough syrup vibe I’ve never cared for. But, I love everything buttercream so I felt compelled to give Cherry Almond Buttercream a try. Every buttercream fragrance I’ve tried from Swan Creek has smelled super authentic and amazing. I’m hoping this one proves true and I end up loving it. We shall see!! Dark, sweet cherries, roasted Italian almonds and whipped fresh buttercream are layered with hints of black plum and mandarin – warm and juicy yet smooth! Hmm. That description sounds very bakery and a fragrance I should love. Smelling the wax, the cherry component is loud and clear but so was the roasted almonds as well. Between those two, it was hard to tell which one was stronger – they both seemed equally represented. That’s a good sign! That means the cherry won’t blow me out of the room. Everything else in the scent description was a little harder to pinpoint but hoping the creamy buttercream makes it’s debut once the wax was melting. And with that said, let’s find out! 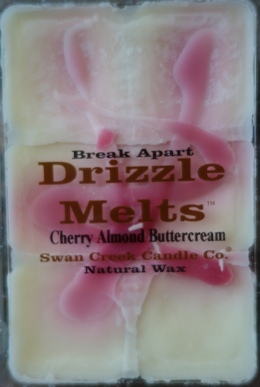 Swan Creek’s drizzle melts are pretty large so one square works perfect per melting session. As soon as I popped the wax in my melters, it didn’t take long for the fragrance to start traveling through my great room and oh wow! A super sharp almond and cherry filled the vast room with aroma. The roasted almonds definitely dominated overall with the cherry coming in a close second and I’m happy to report… there was no cough medicine in sight with this one. The cherry instead smelled sweet and realistic. Could I smell the buttercream? 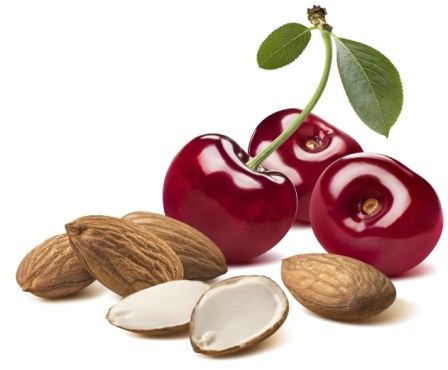 Not really, not with the almond and cherry – those two were pretty much all you could smell, and you know what… I didn’t mind at all. I liked it. Strength – This is a strong one. I would rate it a 10 out of 10 in any size room. Loved!! Definitely give Cherry Almond Buttercream a try if you love cherry and almond scents. You need to love them both or you may not care for this scent. Both elements are loud and clear with this one.